Meeting people, sharing ideas and forming partnerships is how we work at Early Excellence – and here are some of the people you will meet as you explore working with us. 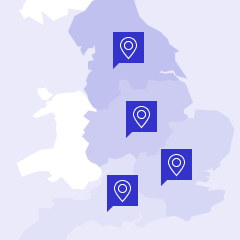 Our National Development Managers lead on strategic developments in EYFS and KS1, whilst our Regional Development Managers focus on facilitating training for local clusters, teaching schools and academy trusts across England. They are supported by our Centre Managers and a team of highly experienced Consultants who lead all of our training and development services. Liz Marsden is the Founder and Director of Early Excellence. She is an inspirational leader who cares deeply about the quality of young children’s education. Prior to establishing Early Excellence, Liz worked as a teacher in Early Years and KS1 and held senior roles as Deputy, Headteacher, LA Advisor and Inspector. She is a highly experienced consultant and trainer in Early Years and KS1. Jan Dubiel is a highly regarded national speaker and the National Director of Early Excellence. He has a strong commitment to developing the pedagogy of early childhood, promoting deep thinking about practice and provision. Through his work as a Nursery, Reception and Y1 Teacher, and more recently as the Programme Leader for the EYFS and EYFS Profile at QCDA, Jan has pursued a particular interest in assessment and ways to document and demonstrate children’s achievement and progress. Phil is our Head of Regional Development for London and the South, having previously worked as our Head of Centre in London since 2016. Over the last 20 years he has worked across the early years and primary sector, including headship positions. His most recent role was as head of an integrated early years centre. With a passion for collaborative practice and professional development; Phil has worked in partnership with early years settings, schools, teaching schools and local authorities to develop and deliver personalised programmes to meet their needs. Anna is a skilled and innovative primary school teacher who believes strongly in creating challenging and engaging learning opportunities. Her leadership work has centred around developing high quality provision in early years and KS1 with a key focus on supporting smooth transition. Since starting her career, Anna has worked in a variety of challenging inner London primary schools and has provided peer to peer support for a variety of schools in difficulty. Her passion for teaching children 3-7yrs, is underpinned by an in-depth knowledge of child development, developmental psychology and language development. As part of the Early Excellence Regional Development Team Nikki brings with her over twenty years experience of supporting quality Early Years practice. After ten years teaching in both the EYFS and KS1, she moved to Leicestershire County Council in an advisory role and soon became a Senior Improvement Advisor. In this role Nikki provided advice, support and challenge to childminders, settings and schools – she developed and delivered a wide range of CPD and was the EYFS Moderation Manager. Following this she became Service Manager for the Early Learning and Childcare Service and worked strategically to support leaders and managers in Teaching Schools and Multi-Academy Trusts. Nova has an extensive career of 25 years teaching in primary schools. She has taught children from YR to Y6 with roles including Deputy Head and Assistant Head holding responsibility for EYFS and KS1. Her expertise lies in developing a broad and balanced curriculum supported by an effective learning environment that enables children to acquire and apply knowledge through independent work and enquiry and is passionate about involving children in their own learning. Nova is an experienced in peer to peer support and delivers KS1 CPD and training. Maria has worked in Early Years for over 20 years, most recently as a Deputy Headteacher and EYFS Lead. She has also worked for the Cambridgeshire Local Authority Advisory Team, as an EYFS Moderator, a College Lecturer, a Pre-school Learning Alliance Advisor, and worked across Day Nurseries in management roles and owned her own pre-school business. As a qualified Forest School Level 3 Practitioner Maria has written and delivered a wide range of EYFS training and helped set up a Cambridgeshire Forest School Network. Matthew has worked in early education for 16 years. He has taught and led the Early Years Foundation Stage in school reception classes and nurseries and has lectured in Early Years at Canterbury Christchurch University. Most recently he has worked as an Early Years Adviser with Kent County Council, developing and delivering training and providing advice, support and challenge to local settings and schools. Andy Burt is an experienced EYFS Teacher and School Leader who has explored open-ended, creative and innovative approaches to learning over a number of years. Research done in collaboration with Professor Pat Broadhead, focusing on Andy’s work, led to the exploration of ‘the whatever you want it to be place’ and the co-written text Understanding Young Children’s Learning through Play which was published by Routledge in 2011. Ruth is an experienced senior leader. She has a wealth of experience in primary education with over 20 years’ experience in senior leadership roles including primary headship. Ruth has worked as a School Improvement Advisor, Early Years Consultant and moderator in several Local Authorities; supporting leaders and teachers to improve outcomes for pupils. Ruth is passionate about Early Years, having taught Nursery, YR and KS1. She is also a trained Ofsted inspector. Lynda is a highly experienced school leader, advisor and consultant who has worked in the Early Years and Primary Sector for 35 years. She has a strong reputation for supporting school improvement developed through her roles as Headteacher of Primary School, LA Advisor, Head of Early Years & Childcare and School Improvement Partner for Salford Local Authority. Jude is a highly talented early years consultant and trainer. She has a background steeped in early years having held a range of roles, first as a YR Teacher and then later as an Early Years Consultant and Children’s Centre Teacher. A trained NVQ Assessor and Ofsted Inspector, Jude has delivered training with BEAM on early years maths and collaborated with Michael Jones as co-author of Let’s Talk About Maths. Mair is a skillful EYFS Consultant based in our London Centre. She has more than 22 years teaching experience in a variety of schools and settings; working with 3-6 year olds. Mair has led Foundation Stage teams in schools across different local authorities and is committed to ensuring quality professional development for all early years professionals, whatever their role. She is especially passionate about maximizing children’s learning through the creation of rich, meaningful and inspiring learning environments. Louise has wide experience of teaching, training and writing educational materials across early years, primary and special education. As an LA Early Years Adviser in Herefordshire she set up partnership projects to support the inclusion of children with autism, early language and complex needs. Louise led the ‘Early Years Networks’ programme for The National Education Trust and wrote materials for the Early Support Developmental Journals and Scope’s ‘Learning Together’ online toolkit.